I could not be more thrilled that the temperatures are finally warm enough to enjoy long days in the garden and cool evenings on the patio. As an outdoorsy girl, living in the city can be wearing on my nerves. We are blessed to live near the river and love to take family walks together, but we don’t enjoy the small outdoor spaces surrounding our home as much as we should. This spring/summer, I am determined to get my family to eat more meals outside on our back patio! Now, if I had my heart’s desire, our back patio would look something like a page from a Pottery Barn catalog with plush seating, a water feature, and a fire pit. We don’t have a lot of space in our backyard or up on our roof deck, but I know I can make all of our outdoor rooms more enticing this year and I’m on a mission to do so. So here is my first secret weapon towards Operation Enjoy the Outdoors! It is one of the TIKI Brand Fire Sculptures that is available exclusively at Home Depot. They retail between $49-$89 depending on the style you choose. It’s a great and economical way to add a fire feature to your outdoor space. What I especially LOVE about this Tiki Fire Sculpture is that you can fill it with Off! BiteFighter Torch Fuel to dissuade those pesky mosquitoes from sticking around your yard. I was impressed with how easy the Tiki Fire Sculpture is to fill. All you have to do is open the drop-in canister, attach the easy pour spout to your fuel, and fill your canister to the fill line. 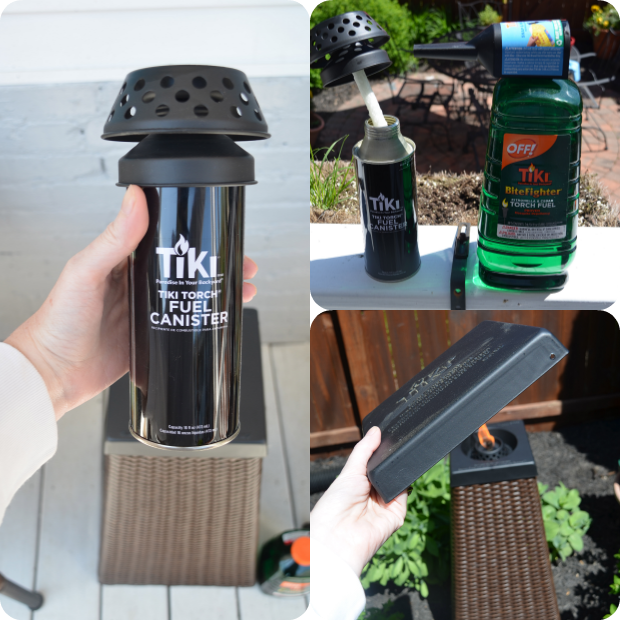 Once you screw the cap back on, just drop your canister into your Tiki Fire Sculpture and light once the wick has absorbed the fuel. When you want to snuff out your torch or cap it off when not in use, simply place the snuff cap on the top. You can witness the warm flame in full action in the video below. The smell of the fuel burning is pleasant and the ambiance of the fire is romantic. I like that the base of my TIKI Brand Fire Sculpture is nice and wide, so I don’t have to worry about my dogs or kids easily knocking it over. Obviously with all fire elements, safety first! Make sure you don’t have your sculpture lit when not attended and keep the fuel away from small children. My boys are 6 and 8 and have a healthy fear and respect for fire and safety. Now I can check “add fire element to yard” off of my to do list and start working on my water feature! Do you have a fire element in your outdoor space? If not, I encourage you to check out the TIKI Brand Fire Sculptures at Home Depot and you can also find TIKI Brand on Facebook to see if it might be right for your outdoor space! P.S. 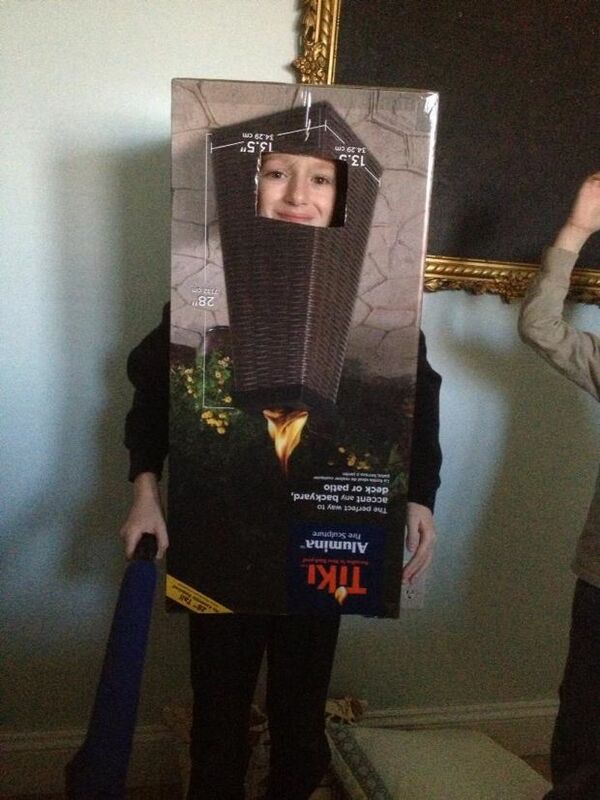 The box makes a great costume as well. LOL! This is quite interesting, mosquitoes are everywhere and children are the one who are most affected in this situation. Though the most effective thing that we must always do is to have a clean surroundings and with the help of things like this can somehow assure us we can live in a safe way. I love these but can they be used up on a stone wall or raised up some how? I too have a strong fear and respect for fire but I have a 17 month old and a 5 year old and they are still learning. They look like they are kid height. Hi Dina, I personally wouldn’t recommend these for anyone with small children. It’s a high open flame and it just wouldn’t be worth the risk to me. And yes, Ana is a friend of mine and I love her and her work :). Those look great! And are definitely a great touch to the yard! Do they work well at keeping the mosquitoes away? Thanks Ashley! It’s worked great for me when sitting or working near it at dusk but I don’t think it would work in a large yard unless you were burning several. We have a tiny yard so it’s perfect for the space. I love sitting out doors also especially at night. But I always wonder what everyone does with all of the cushions and pillows on the furniture. Over night you get the (what I call ) morning dew which makes everything wet. It seems like a lot of trouble to have to take all the cushions off every night. What do you do? Everything is set up so nice, I like your style. Great question! I leave my cushions out on both of our covered porches. They are outdoor cushions and do okay. They don’t get dewy at all since they aren’t sitting near grass or a heavy moisture area. 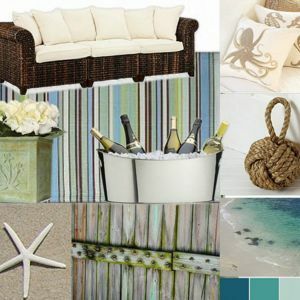 I will be building sectional seating for our roofdeck pretty soon and I’m going to build a storage center for cushions. It IS a pain to lug them in and out but just a quick chore to enjoy the outdoors. My big question is: did you by any chance try the mosquito repellant and does it actually fend off mosquitos around the area you are sitting? Hi Yvonne, I did try the Tiki torch fuel that was called “BiteFighter”. It smells like citronella and cedar oil. I had it burning at dusk while I was gardening and didn’t get bit. My yard is very, very tiny since we live in an urban area and we have a major mosquito problem. I was within 10 feet of the torch at all times. I’m guessing that if you have a larger yard you would need more than one tiki sculpture burning to protect a larger space. I hope that helps. Great light and the costume is an ingenious way to use the box! That looks great! 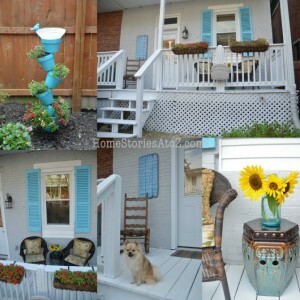 Such a nice alternative to the cheesy tiki torches that stick in the ground! haha. Here, here! 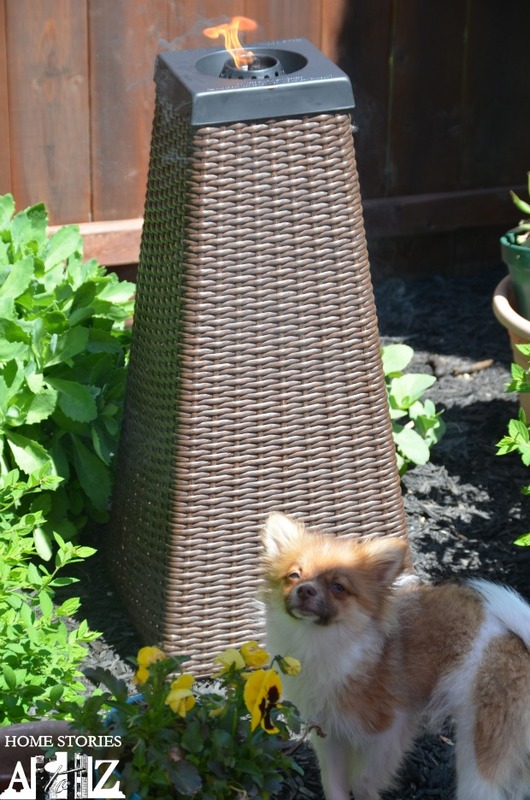 Pottery Barn patios for ALL! 🙂 And yes, I like this option WAY better than the tiki torches. Although, I have to say that I’ve seen a few modern ones lately that are pretty cute compared to the old ones. My neighbors just installed some that are metal and look super cute.